Ever considered grant funding? If you're working on a new product, process or service that is a step-change in comparison to the current state-of-the-art solution, and can show a convincing and scalable route-to-market plan, you might be eligible for one of many grant schemes currently open for applications! Deadlines are coming up in the next few months, and there are a few things you need to keep in mind when evaluating your eligibility. Hence, the Business Funding Show has decided to organise the 'Boo! Don't be Scared of Grant Funding Applications!' event this Halloween (31st of October). We will welcome the grant funding specialists Alex Chalkley and Tom Kennard from Granted Consultancy, who will be able to offer guidance on the grant schemes most suitable for your business. Granted Consultancy is a strategic business consultancy that specialises in identifying and securing non-dilutive funding to support companies with the development and commercialisation of new and innovative products, services and technologies. They have helped countless entrepreneurs secure grant funding. There are hundreds of schemes currently open, with over 20 new ones having been recently introduced by the government, as well as high-profile funding bodies like Innovate UK. Many of these are sector-agnostic, with others focusing on the popular sectors of digital, technology, transport, AI, AR, low carbon or energy. · You will need to present a project planwith a future start date that runs over 6-36 months and results in significant progress being made in the research and development of your proposed product, process or service. · You need to think about your costs; cost categories include Staff Wages & Overheads, Materials, Capital Equipment, Subcontractors, Travel & Subsistence and IP advice. · If you can show that your proposed solution out-performs the current best-in-market and makes quantifiable cost and/or efficiency savings, then you are generally ‘in scope’ to receive grant funding. Grant funding is competitive and one of the primary motivations for a funder is to support game-changing, disruptive, innovative projects. If you have a scheme in mind, but are unsure about whether your project qualifies, talk to one of the Granted Consultancy team who have extensive experience of matching projects to grant funds. At the event, we will discuss the most exciting schemes currently open, and how your business can seek support in applying for them. If you would like to find out more about the grant application process, as well as further details of the current schemes, join us at 'Boo! 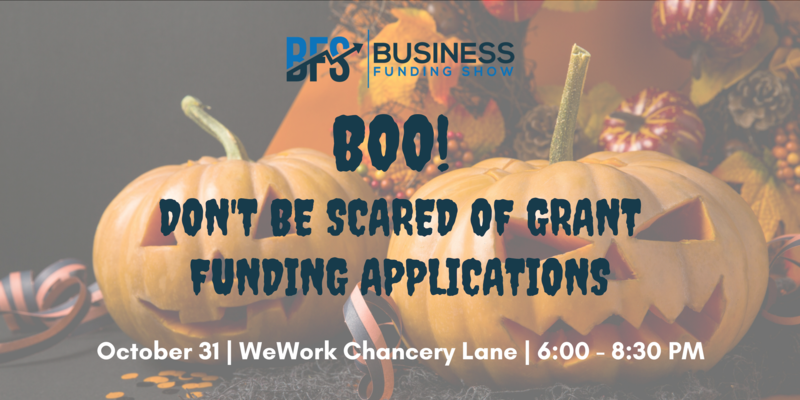 Don't be Scared of Grant Funding Applications! ', which will take place at 6pm on the 31st of October 2018 at WeWork Chancery Lane. Click here for more info and to secure tickets.